Free Ticket to Japan ! Join with us Now ! JEFI, simple and easy to remember! Japanese learners in Indonesia has increased very much. I met a lot of students who have aspirations, willing to learn. Hopefully alot of the number of Indonesian students studying in Japan more, learn many things in Japan, will realize the dream of your own. Ryuji Tanaka - CEO Tanaka Forest Holding, Co.Ltd. Relations between two people is not only based on the economic and politics. 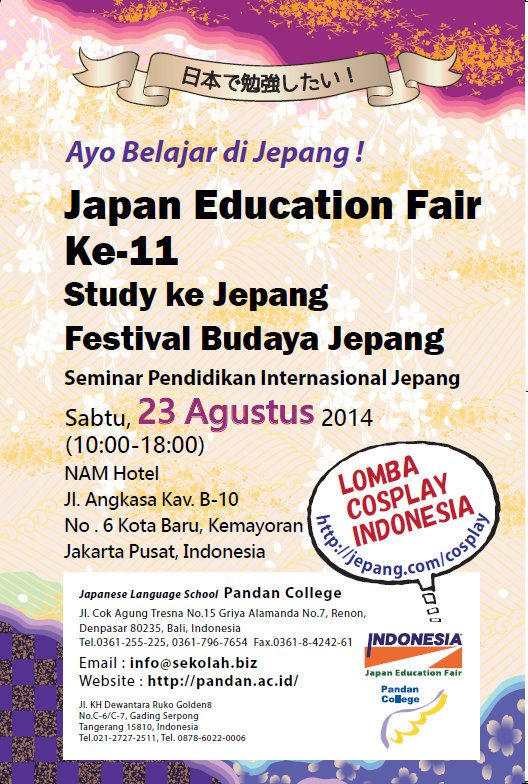 Japan is one of several countries in the world and Indonesia is on of the best Japan's partner. Therefore this activity is an outstanding and we have to fully support for the better relations in the future, especially on the educational area. A basic of human life is on this educational field. Success always for PT Pandan International. Let me know your email, subscribe here, write bellow on the box, and we will send you all information regarding JEFI in the future. Your email will be kept confidential.